The Romanesque style appeared to be a continuation of the Roman tradition of building, albeit a much simplified and less technically competent version. Romanesque architecture is the term that describes the architecture of Europe which emerged from the dark ages of the late tenth century and evolved into the Gothic style during the twelfth century. The Romanesque style in England is more traditionally referred to as Norman architecture. Romanesque architecture is characterized by its massive quality, its thick walls, round arches, sturdy piers, groin vaults, large towers, and decorative arcading. 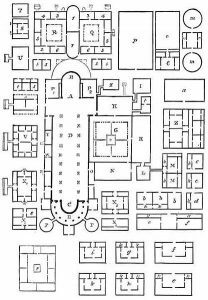 Each building has clearly defined forms and frequently has very regular and symmetrical plans. The overall appearance is of simplicity when compared to the Gothic buildings that were to follow. The style can be identified across Europe, despite regional characteristics and a range of different materials. The term “Romanesque” was first applied by the archaeologist Charles de Gerville, in the early nineteenth century, to describe Western European architecture from the fifth to the thirteenth century, at a time when the actual dates of many of the buildings so described had not been ascertained. The term is now used for a more restricted period from the late tenth to the twelfth century. The word was used to describe the style which was identifiably Medieval and prefigured the Gothic, yet maintained the rounded Roman arch. 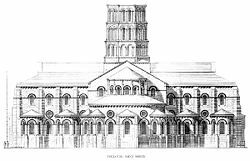 The Romanesque style appeared to be a continuation of the Roman tradition of building, albeit a much simplified and less technically competent version. 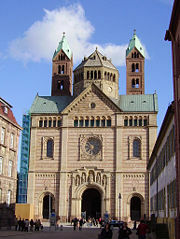 The term “Pre-Romanesque art” is sometimes applied to architecture in Germany of the Carolingian and Ottonian periods. 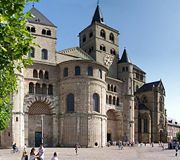 “First Romanesque” is applied to buildings in Italy, Spain, and parts of France that have Romanesque features but pre-date the influence of the monastery of Cluny. 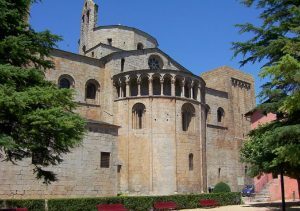 Prior to the later influence of the Abbey of Cluny in the tenth century, architecture of a Romanesque style was simultaneously developing in northern Italy, parts of France, and in the Iberian Peninsula. The style, sometimes called “First Romanesque” or “Lombard Romanesque,” is characterized by thick walls, lack of sculpture, and the presence of rhythmic ornamental arches known as a Lombard band. The Holy Roman Empire had been established by Charlemagne, who was crowned by the Pope in St Peter’s Basilica on Christmas Day in the year 800 C.E., with an aim to re-establish the old Pax Romanum, to the glory of Jesus Christ. Charlemagne’s political successors continued to rule much of Europe, with a gradual emergence of the separate political states which were eventually to become welded into nations, either by allegiance or defeat. In 1066, an invasion of England occurred by William, the Duke of Normandy. After the invasion, the England and Normandy unified and the building of both castles and churches reinforced the Norman presence. Much of Europe was heavily influenced by feudalism, in which peasants held tenure from local rulers over the land that they farmed in exchange for military service. The result of this was that they could be called upon, not only for local and regional spats, but to follow their lord to travel across Europe to the Crusades, if they were required to do so. The Crusades, 1095-1270, brought about a very large movement of people in addition to ideas and trade skills, particularly those involved in the building of fortifications and the metal working needed for the provision of arms, which was also applied to the fitting and decoration of buildings. The continual movement of people, rulers, nobles, bishops, abbots, craftsmen, and peasants was an important factor in creating homogeneity in building methods and a recognizable Romanesque style, despite regional differences. The system of monasticism in which the mendicant become members of an order, with common ties and a common rule living in a mutually dependant community, was established by the monk Benedict in the sixth century. The Benedictine Monasteries spread from Italy throughout Europe, but were always by far the most numerous in England. They were followed by the Cluniac order, the Cistercians, Carthusians, and Augustinian Canons. One of the effects of the Crusades, which were intended to wrest the Holy Places of Palestine from Islamic control, was to excite a great deal religious fervor which in turn inspired great building programs. 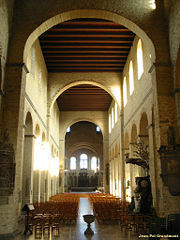 The Nobility of Europe, upon safe return, thanked God by the building of a new church or the enhancement of an old one. Likewise, those who did not return from the Crusades could be suitably commemorated by their family in a work of stone and mortar. The Crusades resulted in the transfer of, among other things, a great number of Holy Relics of saints and apostles. 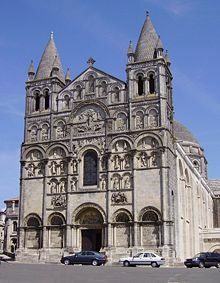 Many churches, like Saint-Front, Périgueux, had their own home grown saint while others, most notably Santiago de Compostela, claimed the remains and the patronage of a powerful saint, in this case one of the Twelve Apostles. Santiago de Compostela, located near the western extremity of Galicia (present day Spain) became the most important pilgrimage destination in Europe. Most of the pilgrims travelled the Way of Saint James on foot, many of them barefooted as a sign of penance. They moved along one of the four main routes that passed through France, congregating for the journey at Jumieges, Paris, Vezelay, Cluny, Arles, and St. Gall in Switzerland. They crossed two passes in the Pyrenees and converged into a single stream to traverse north-western Spain. Along the route they were urged on by those pilgrims returning from the journey. 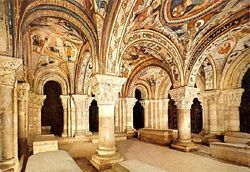 On each of the routes abbeys such as those at Moissac, Toulouse, Roncesvalles, Conques, Limoges and Burgos catered for the flow of people and grew wealthy from the passing trade. Saint-Benoît-du-Sault, in the Berry province, is typical of the churches that were founded on the pilgrim route. Romanesque architecture is often divided into two periods known as the “First Romanesque” style and the “Romanesque” style. The difference is chiefly a matter of the expertise with which the buildings were constructed. The First Romanesque employed rubble walls, smaller windows and un-vaulted roofs. A greater refinement marks the Second Romanesque, along with increased use of the vault and dressed stone. The walls of Romanesque buildings are often of massive thickness with few and comparatively small openings. They are often double shells, filled with rubble. In Romanesque architecture, piers were often employed to support arches. They were built of masonry and square or rectangular in section, generally having a horizontal molding representing a capital at the springing of the arch. Sometimes piers have vertical shafts attached to them, and may also have horizontal moldings at the level of base. Although basically rectangular, piers can often be of highly complex form, with half-segments of large hollow-core columns on the inner surface supporting the arch, or a clustered group of smaller shafts leading into the moldings of the arch. Some buildings, like the atrium at San Clemente in Rome, may have an odd assortment of columns in which large capitals are placed on short columns and small capitals are placed on taller columns to even the height. Architectural compromises of this type would have been unthinkable to either Roman or Gothic architects. Salvaged columns were also used to a lesser extent in France. In Germany and other areas, small columns cut from a single piece of stone were used alternately between more massive piers. In most parts of Europe, Romanesque columns were massive, as they supported thick upper walls with small windows, and sometimes heavy vaults. 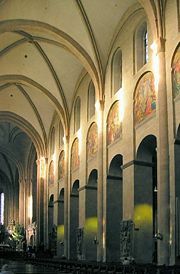 The most common method of construction was to build them out of stone cylinders called drums, as in the crypt at Speyer Cathedral. The Corinthian capital is essentially round at the bottom where it sits on a circular column and square at the top, where it supports the wall or arch. This form of capital was maintained in the general proportions and outline of the Romanesque capital. This was achieved most simply by cutting a rectangular cube and taking the four lower corners off at an angle so that the block was square at the top, but octagonal at the bottom, as can be seen at St. Michael’s Hildesheim. This shaped lent itself to a wide variety of superficial treatments, sometimes foliate in imitation of the source, but often figurative. In Northern Europe the foliate capitals generally bear far more resemblance to the intricacies of manuscript illumination than to Classical sources. In parts of France and Italy there are strong links to the pierced capitals of Byzantine architecture. It is in the figurative capitals that the greatest originality is shown. 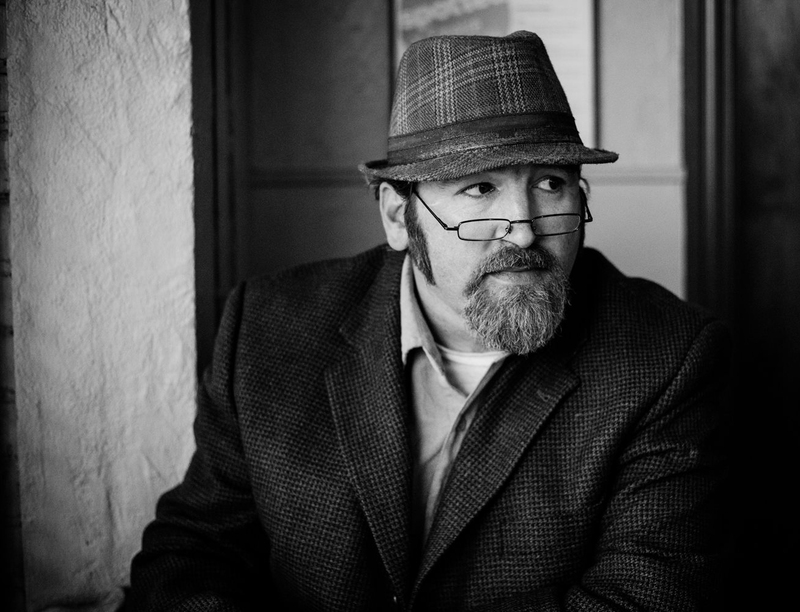 While some are dependent on manuscripts illustrations of Biblical scenes and depictions of beasts and monsters, others are lively scenes of the legends of local saints. The capitals, while retaining the form of a square top and a round bottom, were often compressed into little more than a bulging cushion-shape. This is particularly the case on large masonry columns, or on large columns that alternate with piers as at Durham. 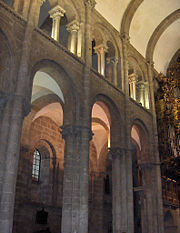 A common characteristic of Romanesque buildings, occurring both in churches and in the arcades which separate large interior spaces of castles, is the alternation of piers and columns. The simplest form that this takes is to have a column between each adjoining pier. Sometimes the columns are in multiples of two or three. 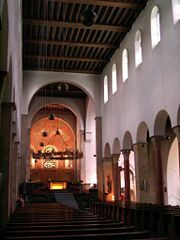 At St. Michael’s, Hildesheim, an A-B-B-A alternation occurs in the nave while an A-B-A alternation can be seen in the transepts. Arches in Romanesque architecture are semicircular, with the exception of a very small number of buildings such as Autun Cathedral in France and Monreale Cathedral in Sicily, both of which pointed arches have been used extensively. It is believed that in these cases there is a direct imitation of Islamic architecture. The majority of buildings have wooden roofs, generally of a simple truss, tie beam, or king post form. In the case of trussed rafter roofs, they are sometimes lined with wooden ceilings in three sections like those which survive at Ely and Peterborough cathedrals in England. In churches, typically the aisles are vaulted, but the nave is roofed with timber, as is the case at both Peterborough and Ely. 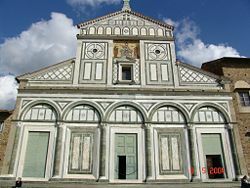 In Italy, open wooden roofs are common, and tie beams frequently occur in conjunction with vaults, the timbers have often been decorated as at San Miniato al Monte, Florence. Vaults of stone or brick took on several different forms and showed marked development during the period, evolving into the pointed ribbed arch which is characteristic of Gothic architecture. In ribbed vaults, not only are there ribs spanning the vaulted area transversely, but each vaulted bay have diagonal ribs. In a ribbed vault, the ribs are the structural members, and the spaces between them can be filled with lighter, none-structural material. Because Romanesque arches are nearly always semi-circular, the structural and design problem inherent in the ribbed vault is that the diagonal span is larger and therefore higher than the transverse span. The Romanesque builders used a number of solutions to this problem. One was to have the center point where the diagonal ribs met as the highest point, with the fill of all the surfaces sloping upwards towards it, in a domical manner. 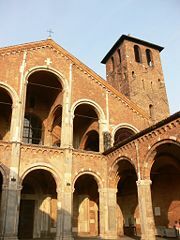 This solution was employed in Italy at San Michele, Pavia and Sant’ Ambrogio, Milan. Another solution was to stilt the transverse ribs, or depress the diagonal ribs so that the centerline of the vault was horizontal, like that of a barrel vault. 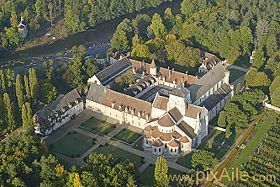 The latter solution was used on the sexpartite vaults at both the Saint-Etienne, the Abbaye-aux-Hommes, and Abbaye-aux-Dames at Caen, France, in the late eleventh and early twelfth centuries. Late in the Romanesque period another solution came into use for regulating the height of diagonal and transverse ribs. This was to use arches of the same diameter for both horizontal and transverse ribs, causing the transverse ribs to meet at a point. This is seen most notably in northern England, at the Durham Cathedral dating from 1128. Durham is a cathedral of massive Romanesque proportions and appearance, yet its builders introduced several structural features which were new to architectural design and were to later to be hallmark features of the Gothic. Another Gothic structural feature employed at Durham is the flying buttress. However, these are hidden beneath the roofs of the aisles. The earliest pointed vault in France is that of the narthex of La Madeleine, Vézelay, dating from 1130. 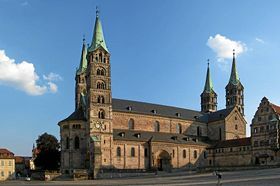 Many parish churches, abbey churches, and cathedrals are in the Romanesque style, or were originally built in the Romanesque style and have subsequently undergone changes. The simplest Romanesque churches are halls with a projecting apse at the chancel end, or sometimes, predominantly in England, a projecting rectangular chancel with a chancel arch that might be decorated with moldings. More ostentatious churches have aisles separated from the nave by arcades. The eastern end of a Romanesque church is almost always semi-circular, with either a high chancel surrounded by an ambulatory as in France, or a square end form which an apse projects as in Germany and Italy. Where square ends exist in English churches, they are probably influenced by Anglo-Saxon churches. 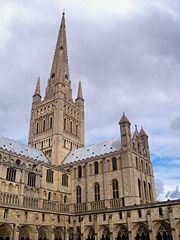 Peterborough and Norwich Cathedrals have retained round east ends in the French style. 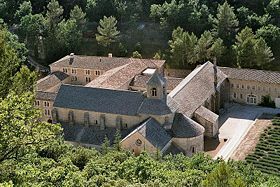 However, in France, simple churches without apses and with no decorative features were built by the Cistercians who also founded many houses in England, frequently in remote areas. Because of the massive nature of Romanesque walls, buttresses are not a highly significant feature, as they are in Gothic architecture. Romanesque buttresses are generally of flat square profile and do not project a great deal beyond the wall. In the case of aisled churches, barrel vaults, or half-barrel vaults over the aisles helped to buttress the nave, if it was vaulted. In the cases where half-barrel vaults were used, they effectively became like flying buttresses. Often aisles extended through two stories, rather than the one usual in Gothic architecture, so as to better support the weight of a vaulted nave. In the case of Durham Cathedral, flying buttresses have been employed, but are hidden inside the triforium gallery. Smaller churches often have a single tower which is usually placed to the western end, in France or England, either centrally or to one side, while larger churches and cathedrals often have two. 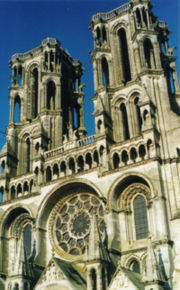 This facade can be seen as the foundation for many other buildings, including both French and English Gothic churches. 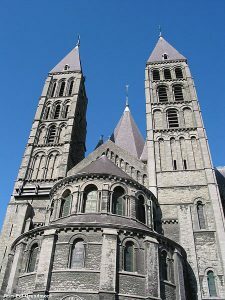 While the form is typical of northern France, its various components were common to many Romanesque churches of the period across Europe. Similar facades are found in Portugal. In England, Southwell Cathedral has maintained this form, despite the insertion of a huge Gothic window between the towers. Lincoln and Durham must once have looked like this. In Germany, Limbourg Cathedral has a rich variety of openings and arcades in horizontal stories of varying heights. 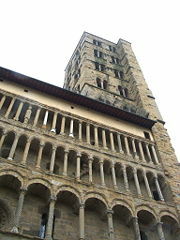 Towers were an important feature of Romanesque churches and a great number of them are still standing. They take a variety of forms, square, circular, and octagonal, and are positioned differently in relation to the church in different countries. In northern France, two large towers, such as those at Caen, were to become an integral part of the facade of any large abbey or cathedral. 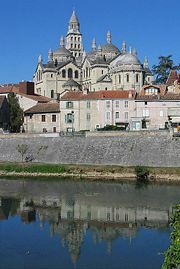 In central and southern France this is more variable and large churches may have one tower or a central tower. 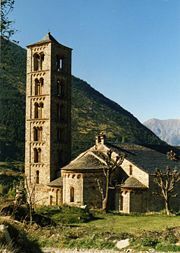 Large churches of Spain and Portugal usually have two towers. Many abbeys of France, such as that at Cluny, had many towers of varied forms. 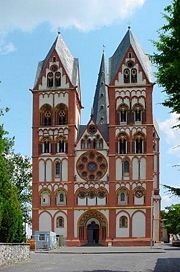 This is also common in Germany, where the apses were sometimes framed with circular towers and the crossing surmounted by an octagonal tower as at Worms Cathedral. 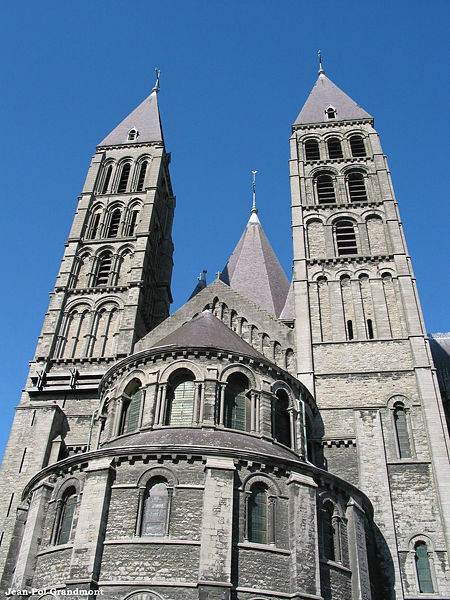 Large paired towers of square plan could also occur on the transept ends, such as those at Tournai Cathedral in Belgium. In Germany, where four towers frequently occur, they often have spires which may be four or eight sided, or the distinctive Rhenish helm shape seen on Limbourg Cathedral. In Italy, there are a number of large free-standing towers which are circular, the most famous of these being the Leaning Tower of Pisa. In other countries where circular towers occur, such as Germany, they are usually paired and often flank an apse. Circular towers are uncommon in England, but occur throughout the Early Medieval period in Ireland. Octagonal towers were often used on crossings and occur in France, Germany, Spain, and Italy where an example that is unusual for its height is that on the crossing of Sant’ Antonio, Piacenza, 1140. Arcading is the single most significant decorative feature of Romanesque architecture. 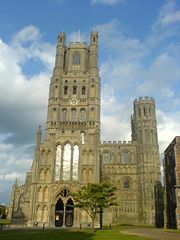 It occurs in a variety of forms; from the Lombard band, a row of small arches that appear to support a roofline or course, to shallow blind arcading, a feature of English architecture and seen in great variety at Ely Cathedral, to open galleries, such as those on both Pisa Cathedral and its famous Leaning Tower. Arcades could be used to great effect, both externally and internally, as exemplified by the church of Santa Maria della Pieve, in Arezzo. In England, such decoration could be discrete, as at Hereford and Peterborough cathedrals, or have a sense of massive energy as at Durham. In Durham, the diagonal ribs of the vaults are all outlined with chevrons, and the moldings of the nave arcade are carved with several layers in a variety of geometric patterns. These features combine to create one of the richest and most dynamic interiors of the Romanesque period. With the fall of the Roman Empire, the tradition of carving large works in stone and sculpting figures in bronze died out, as it effectively did (for religious reasons) in the Byzantine world. Some life-size sculptures were evidently done in stucco or plaster, but surviving examples are understandably rare. The best-known surviving large sculptural work of Proto-Romanesque Europe is the life-size wooden Crucifix commissioned by Archbishop Gero of Cologne in about 965. During the eleventh and twelfth centuries, figurative sculpture flourished. It was based on two other sources in particular, manuscript illumination and small-scale sculpture in ivory and metal. The extensive friezes sculpted on Armenian and Syriac churches are have been proposed as another likely influence. These sources together produced a distinct style which can be recognized across Europe, although the most spectacular sculptural projects are concentrated in South-Western France, Northern Spain, and Italy. One of the most significant motifs of Romanesque design, occurring in both figurative and non-figurative sculpture is the spiral. One of the sources may be Ionic capitals. Scrolling vines were a common motif of both Byzantine and Roman design, and may be seen in mosaic on the vaults of the fourth century Church of Santa Costanza, Rome. Manuscripts and architectural carvings of the twelfth century have very similar scrolling vine motifs. Another source of the spiral is clearly the illuminated manuscripts of the seventh to ninth centuries, particularly Irish manuscripts such as the St. Gall Gospel Book spread into Europe by the Hiberno-Scottish mission. In these illuminations, the use of the spiral has nothing to do with vines or other natural growth. The motif is abstract and mathematical. It is in an adaptation of this form that the spiral occurs in the draperies of both sculpture and stained glass windows. 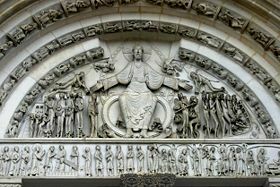 Of all the many examples that occur on Romanesque portals, one of the most outstanding is that of the central figure of Christ at La Madaleine, Vezelay. 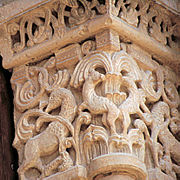 Another influence from insular art are engaged and entwined animals, often used to superb effect in capitals (as at Silos) and sometimes on a column itself (as at Moissac). Many of the smaller sculptural works, particularly capitals, are Biblical in subject and include scenes of Creation and the Fall of Man, episodes from the life of Christ and those Old Testament scenes which prefigure his Crucifixion of Christ and Resurrection, such as Jonah and the Whale and Daniel in the Lions’ Den. Many nativity scenes occur; the theme of the Three Kings was particularly popular. 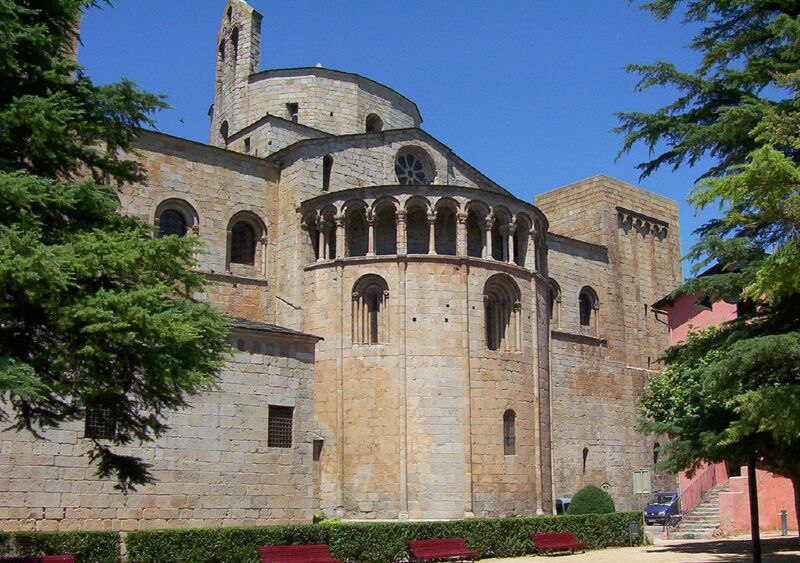 The cloisters of Santo Domingo de Silos Abbey in Northern Spain and Moissac are fine examples surviving complete. The purpose of the sculptural schemes was to convey a message that the Christian believer should recognize their wrong-doings, repent, and be redeemed. The Last Judgment reminds the believers to repent. The carved or painted Crucifix, displayed prominently within the church, reminded the sinner of their redemption. The sculpture which reminded the sinners of their sins often took alarming forms. Since they were not sculptures of Christ, they were usually not large and are rarely magnificent, but are often fearsome or simply entertaining in nature. One of these is the Pórtico da Gloria dating from 1180, at Santiago de Compostela. This portal is internal and is particularly well preserved, even retaining color on the figures and indicating the appearance of much architectural decoration which is now perceived as monochrome. Around the doorway are figures that are integrated with the colonnettes that make up the moldings of the doors. They are three dimensional, but slightly flattened. 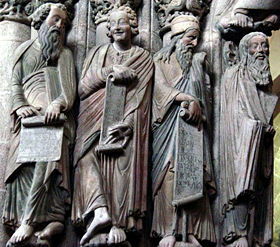 They are highly individualized, in appearance, expression, and bear a strong resemblance to those around the north porch of the Abbey of St. Denis, dating from 1170. Beneath the tympanum there is a carved row of figures playing a range of musical instruments. The large wall surfaces and plain, curving vaults of the Romanesque period lent themselves to mural decoration. Unfortunately, many of these early wall paintings have been destroyed. In England, France, and the Netherlands such pictures were systematically destroyed in bouts of Reformation iconoclasm. In other countries they have suffered from war, neglect, and changing fashion. A classic scheme for the full painted decoration of a church, derived from earlier examples often in mosaic, had, as its focal point in the semi-dome of the apse, Christ in Majesty or Christ the Redeemer by the four winged beasts, symbols of the Four Evangelists, comparing directly with examples from the gilt covers or the illuminations of Gospel Books of the period. If the Virgin Mary was the dedicatee of the church, her image might replace that of Christ. On the apse walls below would be saints and apostles, perhaps including narrative scenes, for example of the saint to whom the church was dedicated. On the sanctuary arch were figures of apostles, prophets or the twenty-four “Heavenly host,” looking in towards a bust of Christ, or his symbol the Lamb, at the top of the arch. The north wall of the nave would contain narrative scenes from the Old Testament, and the south wall from the New Testament. On the rear west wall would be a Last Judgment, with an enthroned and judging Christ at the top. The oldest-known fragments of medieval pictorial stained glass appear to date from the tenth century. 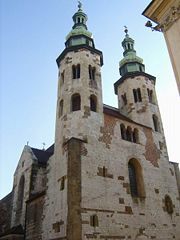 The earliest intact figures are five prophet windows at Augsburg, dating from the late eleventh century. The figures, though stiff and formalized, demonstrate considerable proficiency in design, both pictorially and in the functional use of the glass, indicating that their maker was well accustomed to the medium. At Canterbury and Chartres Cathedrals, a number of panels of the twelfth century have survived, including, at Canterbury, a figure of Adam digging, and another of his son Seth from a series of Ancestors of Christ. Adam represents a highly naturalistic and lively portrayal, while in the figure of Seth, the robes have been used to great decorative effect, similar to the best stone carving of the period. Most of the magnificent stained glass of France, including the famous windows of Chartres, dates from the thirteenth century. Far fewer large windows remain intact from the twelfth century. One such is the Crucifixion of Poitiers, a remarkable composition which rises through three stages, the lowest with a quatrefoil depicting the Martyrdom of St Peter, the largest central stage dominated by the crucifixion and the upper stage showing the Ascension of Christ in a mandorla. The figure of the crucified Christ is already showing the Gothic curve. The window is described by George Seddon as being of “unforgettable beauty”. Paris and its surrounding area were quick to adopt the Gothic style of Abbot Suger, Abbey of Saint-Denis in the twelfth century but other parts of France were slower to take it up, and provincial churches continued to be built in the heavy rubble stone of the Romanesque, even when the openings were treated with the fashionable pointed arch. In Italy, although many churches such as Florence Cathedral and Santa Maria Novella were built in the Gothic style, sturdy columns with capitals of a modified Corinthian form continued to be used. The pointed vault was utilized where convenient, but it is commonly interspersed with semicircular arches and vaults wherever they conveniently fit. The facades of Gothic churches in Italy are not always easily distinguishable from the Romanesque. 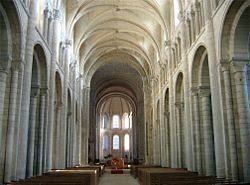 While the term Romanesque, to many, is nothing more than a transition leading up to the Gothic, it is easily forgotten that this style illuminated Europe as it came from the depths of the Dark Ages. There are a myriad of cathedrals and churches that capture the spirit of Romanesque architecture. One of the most prominent, Durham Cathedral, was built in the early tenth century, during the beginning of the Romanesque style. The cathedral towered high on a hilltop, hovering above the landscape like a castle watching over its terrain. “Its interior is cavernous and spectacularly so: the pointed, almost Gothic, ribs that hold up the vaults are in turn supported by rows of massive columns, alternately round and compound (composed of several smaller columns). The surfaces of the round columns are deeply incised by ax carvings–zig-zags and diamond patterns predominate…cutter.”  In fact, much of the architectural decorations of the period were carved into the structural fabric. The extreme masculinity of the work is undeniable, and is one of the prime characteristics of Romanesque art and architecture. During the nineteenth century, when Gothic Revival architecture was fashionable, buildings were occasionally designed in the Romanesque style. There are a number of Romanesque Revival churches, dating from as early as the 1830s and continuing into the twentieth century where the massive and “brutal” quality of the Romanesque style was appreciated and designed in brick. The Natural History Museum, London designed by Alfred Waterhouse, 1879, on the other hand, is a Romanesque revival building which makes full use of the decorative potential of Romanesque arcading and architectural sculpture. The Romanesque appearance has been achieved while freely adapting an overall style to suit the function of the building. 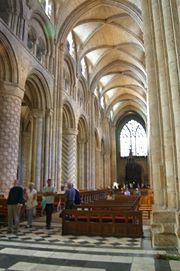 The columns of the foyer, for example, give an impression of incised geometric design similar to those of Durham Cathedral. However, the sources of the incised patterns are the trunks of palms, cycads and tropical tree ferns. The animal motifs, of which there are many, include rare and exotic species. Bannister Fletcher, A History of Architecture on the Comparative Method’’. Gardner, Helen. Art through the Ages’’. George Holmes, ed. The Oxford History of Medieval Europe. 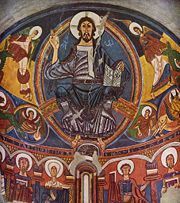 “In the years that followed the year 1000, we witnessed the rebuilding of churches all over the universe, but especially in Italy and Gaul.” Chronicle of Raoul Glaber, quoted by Jean Hubert, Romanesque Art. This technique was also used in the Classical world, notably at the Parthenon. See details at Cologne Cathedral. Atroshenko, V.I. and Judith Collins, The Origins of the Romanesque,p. 144-50, Lund Humphries: London, 1985. Hall, James. A History of Ideas and Images in Italian Art, p154, John Murray: London, 1983. Rolf, Toman. Romanesque. Könemann. 1997. Fletcher, Banister. 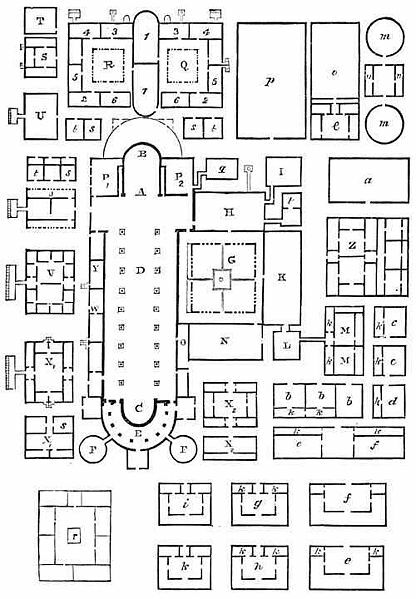 A History of Architecture on the Comparative Method. Elsevier Science & Technology, 2001. Gardner, Helen, Fred S. Kleiner, Christin J. Mamiya. Gardner’s Art through the Ages. Thomson Wadsworth, 2004. Holmes, George.,editor. The Oxford Illustrated History of Medieval Europe. Oxford University Press, 1992. Ischer, Francois. Building the Great Cathedrals. Harry N. Abrams, 1998. Pevsner, Nikolaus. An Outline of European Architecture. Pelican Books, 1991. Beckwith, John. 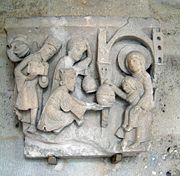 Early Medieval Art. Thames and Hudson, 1985. Kidson, Peter. The Medieval World. Paul Hamly, 1967. Bumpus, T. Francis. The Cathedrals and Churches of Belgium. T. Werner Laurie, 1928. Clifton-Taylor, Alec. The Cathedrals of England. Thames and Hudson, 1989. Harvey, John. English Cathedrals. Batsford, 1961. This entry was posted in Architecture, Art History, History, Medieval, Middle Ages, Roman, Romanesque, Rome. Bookmark the permalink.